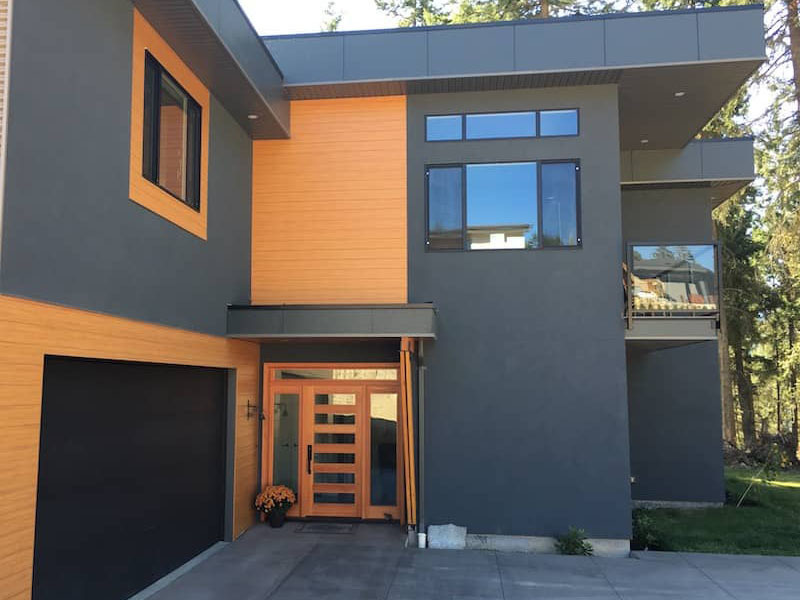 Streamline Exteriors can fulfill all your exterior needs, from building envelopes to soffits and gutters. 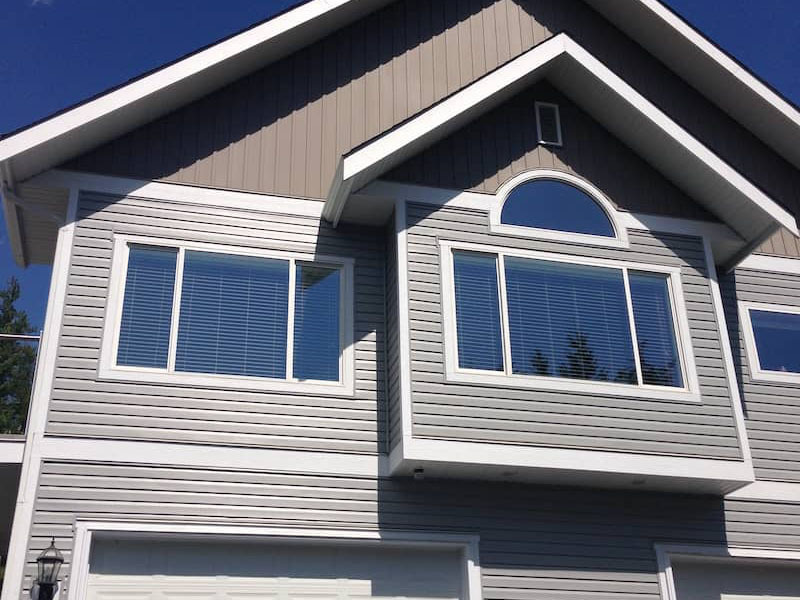 We’re familiar with the most popular siding options such as Hardie, Allura, Cedar, Vinyl, and metal siding options. 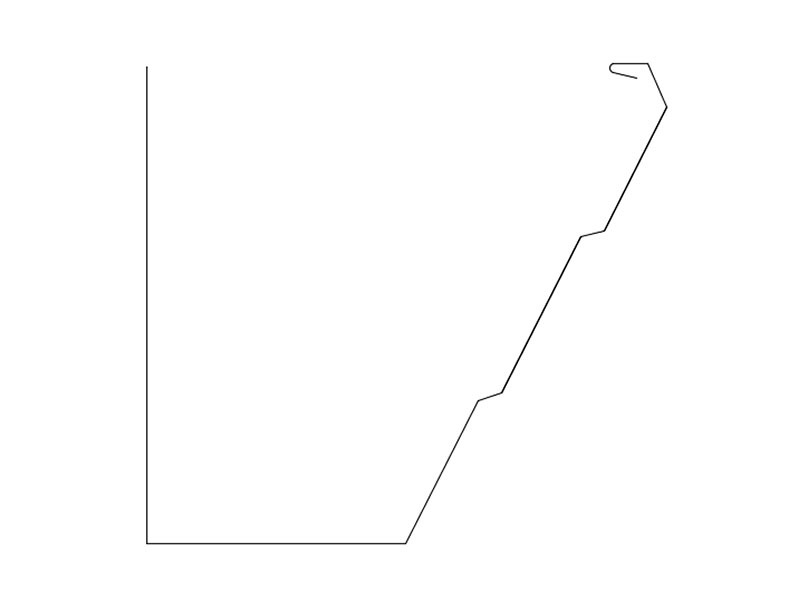 Our crew leaders have decades of experience and are familiar with the unique challenges or our local climate. 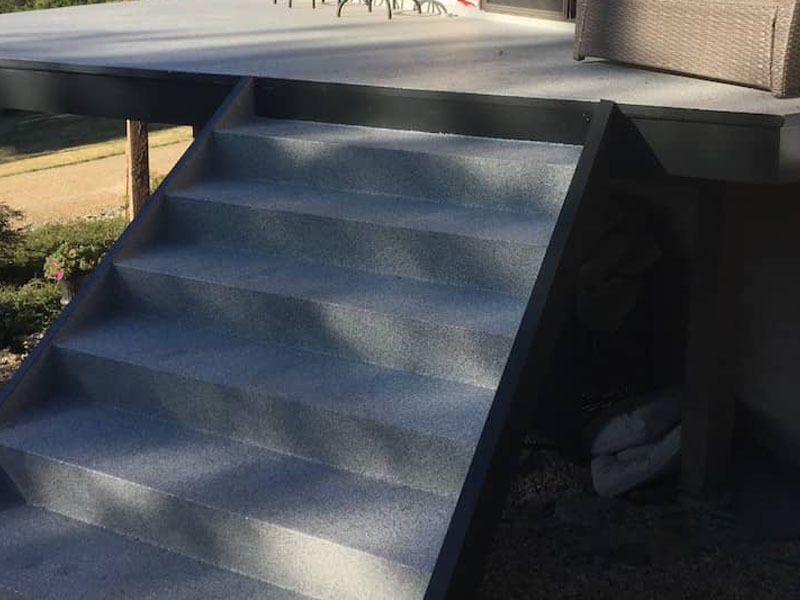 Our warranty is unmatched and we carry five million liability with continuous WCB coverage since 1994. 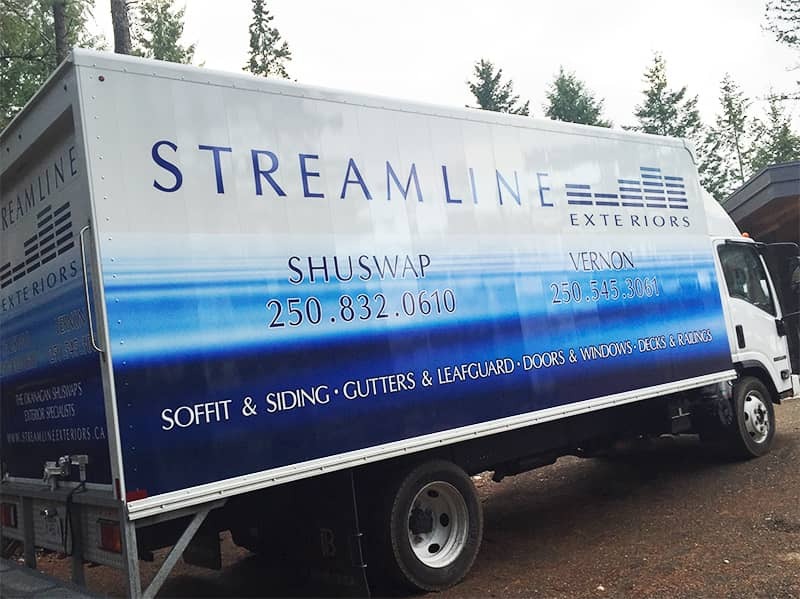 Streamline has offices in Salmon Arm and Vernon, operating from Revelstoke to Kelowna for over 25 years. 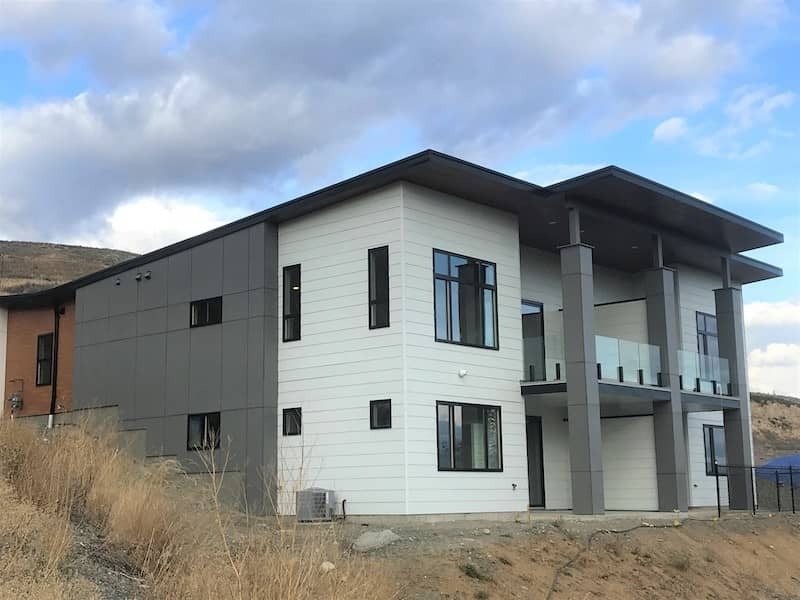 With offices in Salmon Arm and Vernon, Streamline Exteriors has installed over a million feet of rain gutters in the Okanagan Shuswap. 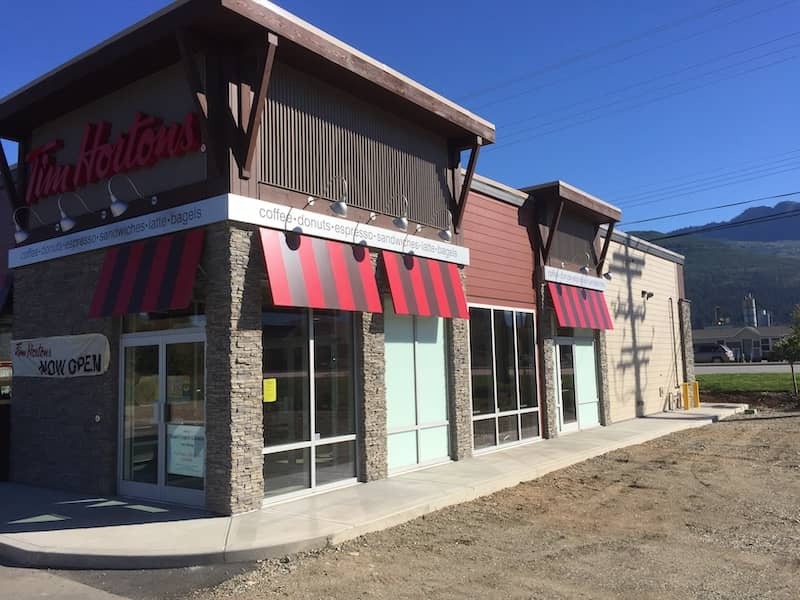 We serve Vernon to Revelstoke, and all points in between. 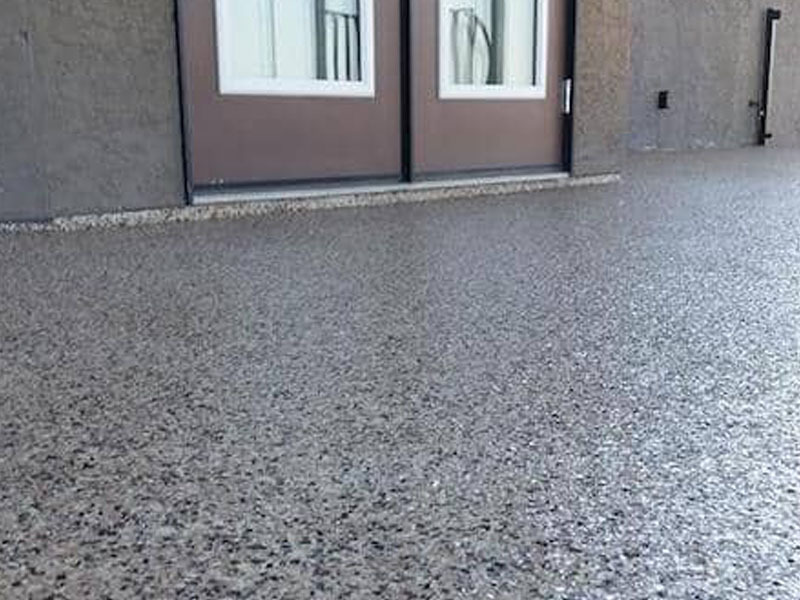 Our familiarity with the unique weather in our area allow us to build and guarantee gutter systems which can withstand extreme stress and last for decades. 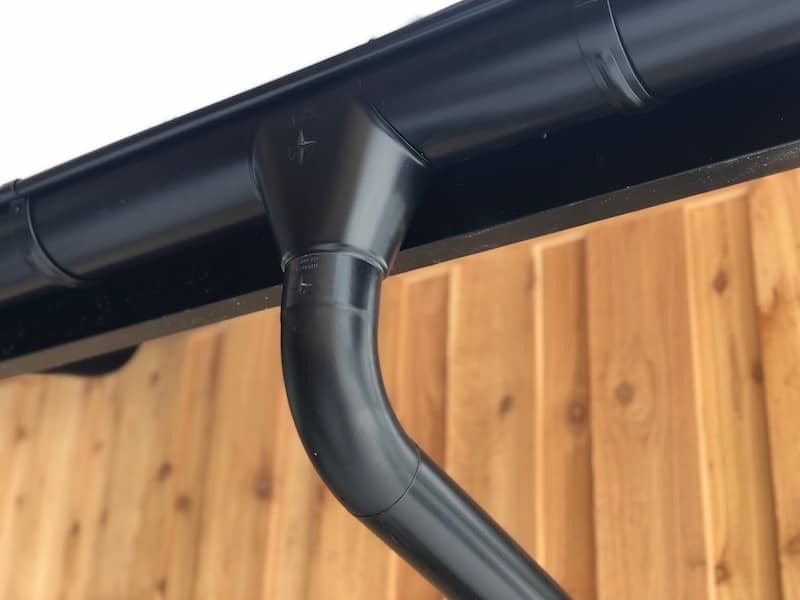 Our gutters are available in over 30 different aluminum colours from Gentek, Kaycan or Royal and can be made from powder coated aluminum, copper or steel. 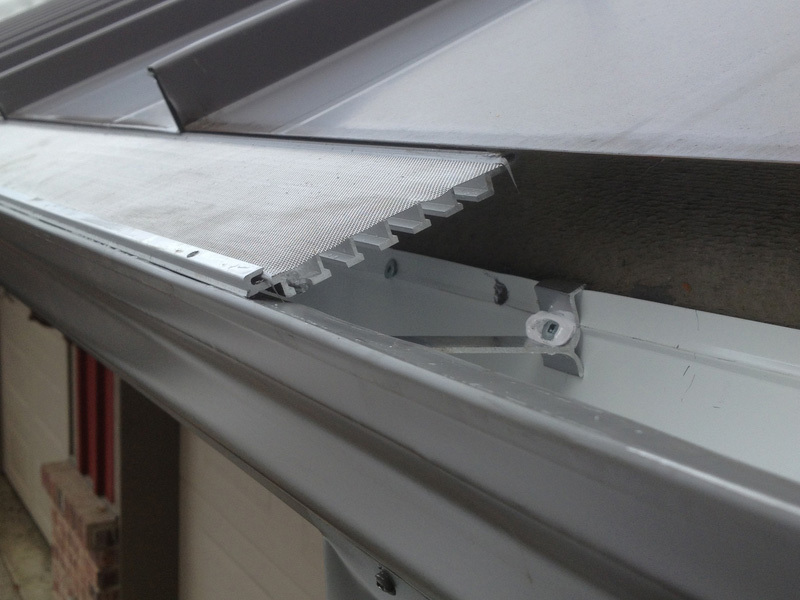 We provide an unmatched warranty on gutter repairs and new installations. 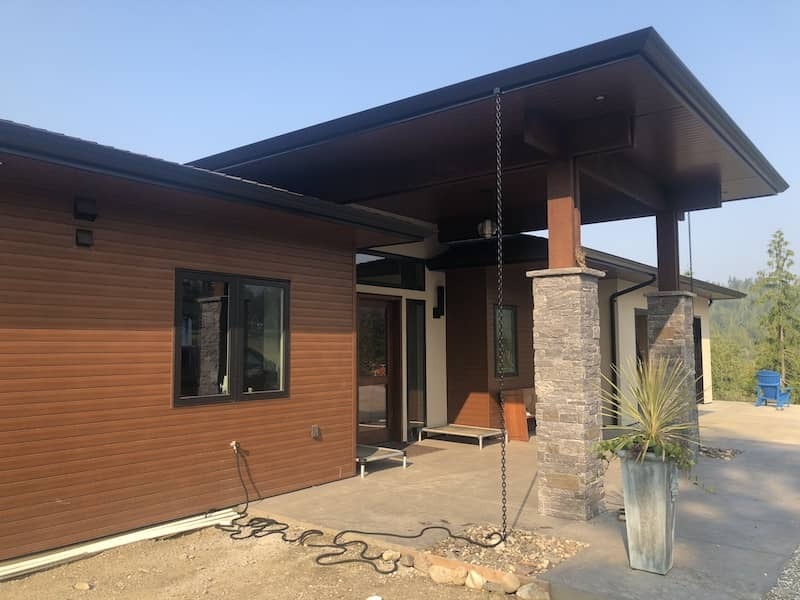 Our gutters are available in many profiles to meet clients’ needs, and we’re the Okanagan Shuswap’s exclusive dealer for the unique no-drip profile edge. 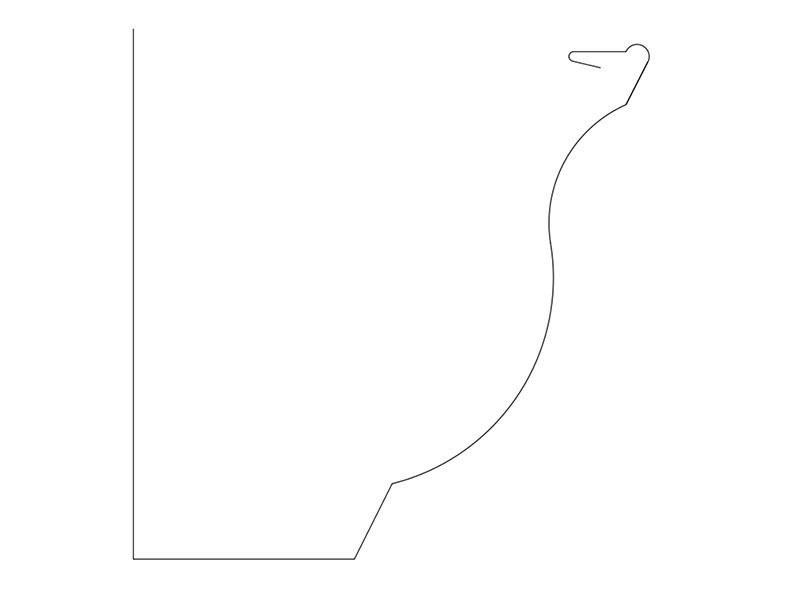 Imitating the curve of an egg, this extremely strong profile will suit heritage or contemporary homes. 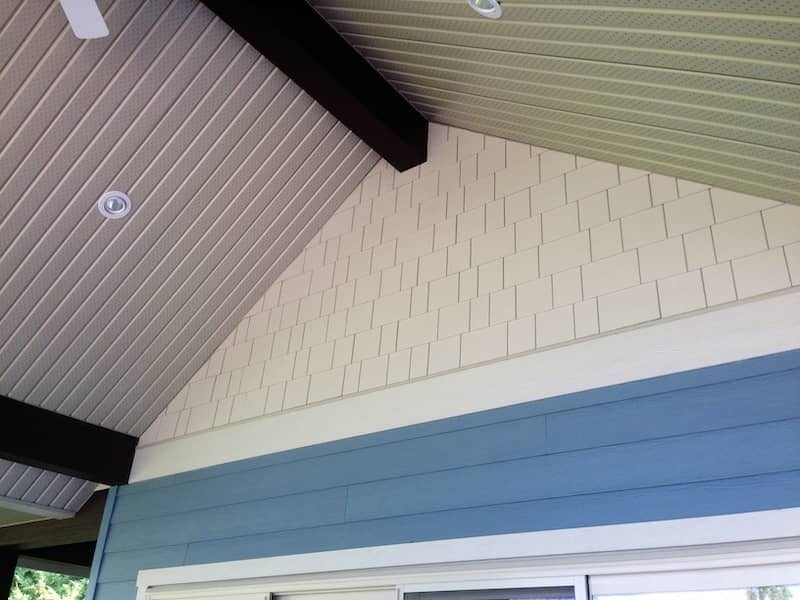 Similar to colonial, with an extra detail line for a richer look. 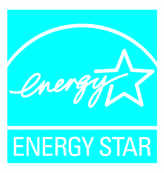 The industry standard, suitable for most homes. 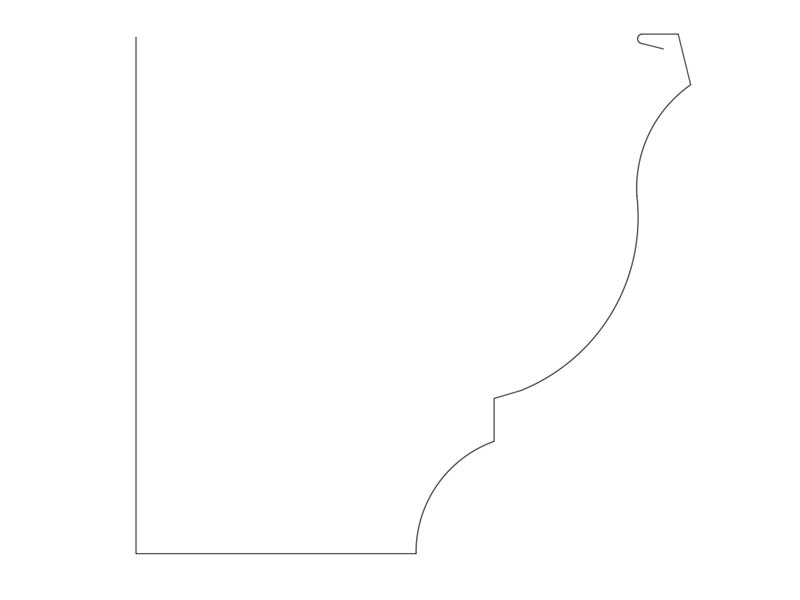 This special-order profile is similar to Stepface, with sharper lines for a modern, minimalist look. 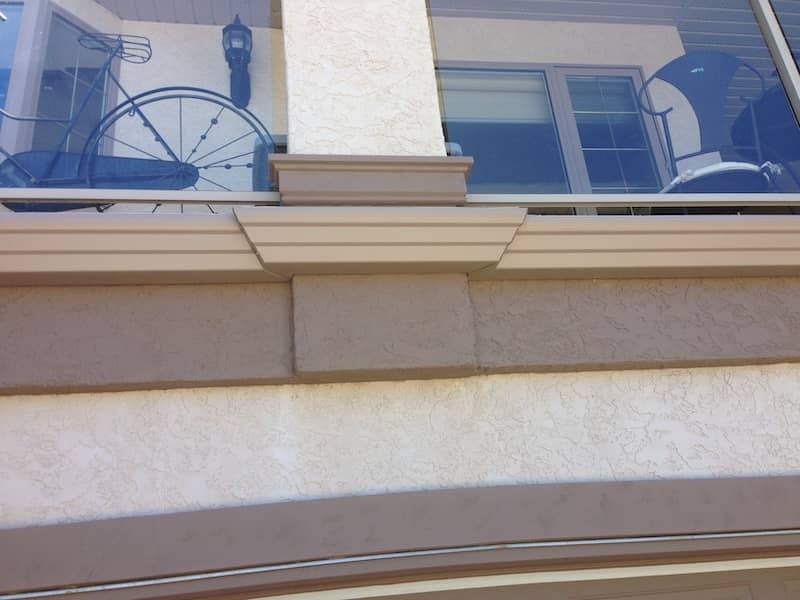 Euro gutter is a non-continuous gutter system which add European charm to any home. 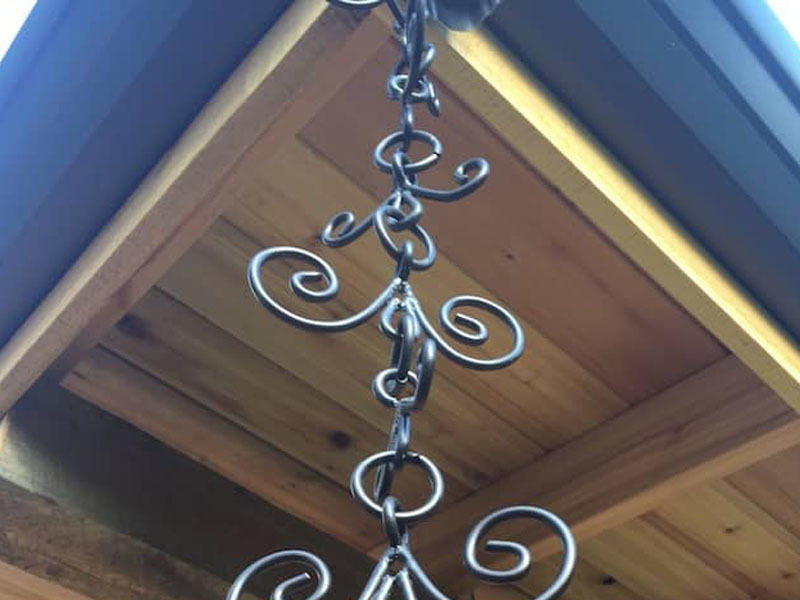 The exterior hangers add strength and make for easy maintenance. 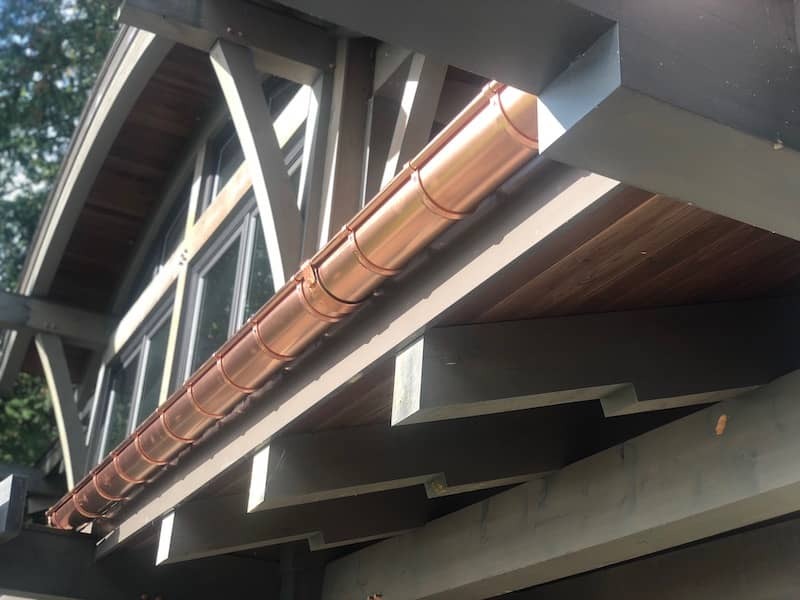 Euro gutters are available in copper, zinc, steel and powder coated steel. 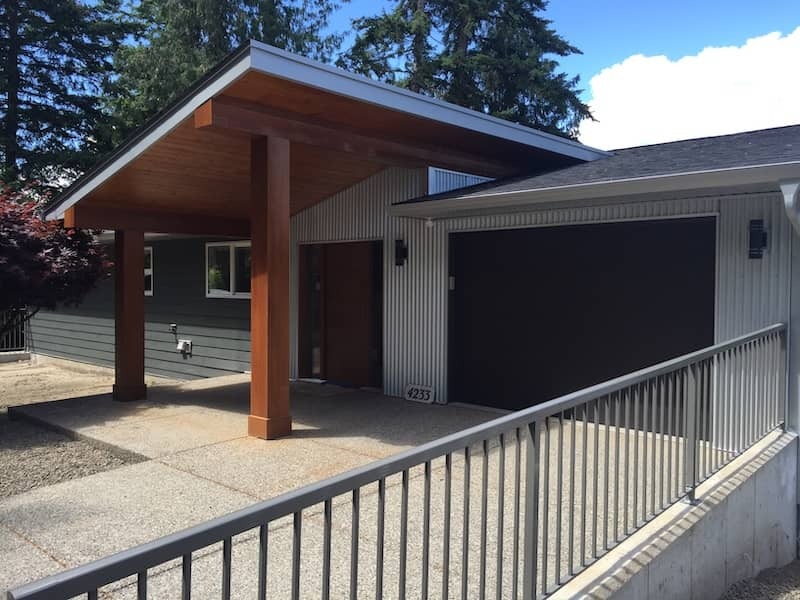 Our standard down-pipe is a two by three-inch, freeze-protected pipe, but is available in four by three-inch, custom curved pipes, rain chains and rain buckets. 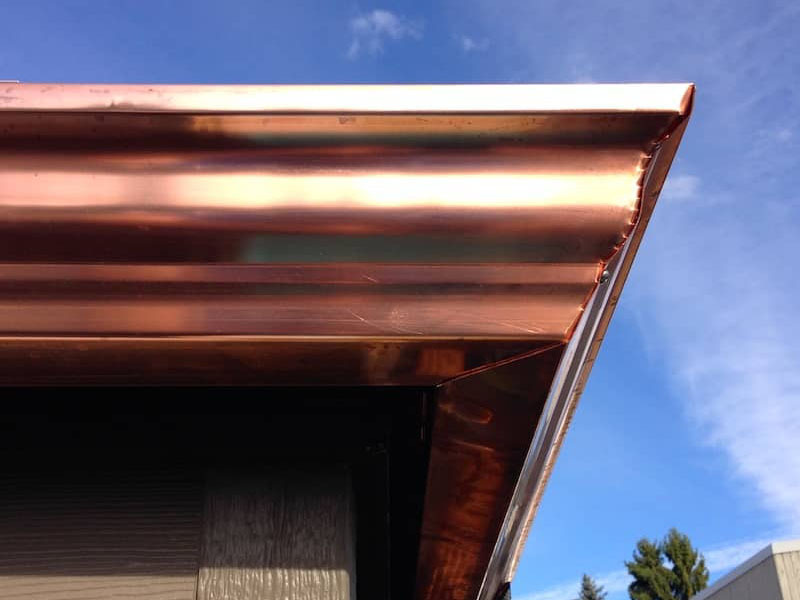 We offer roof pans to protect your shingles and custom metal work to control any water problems. 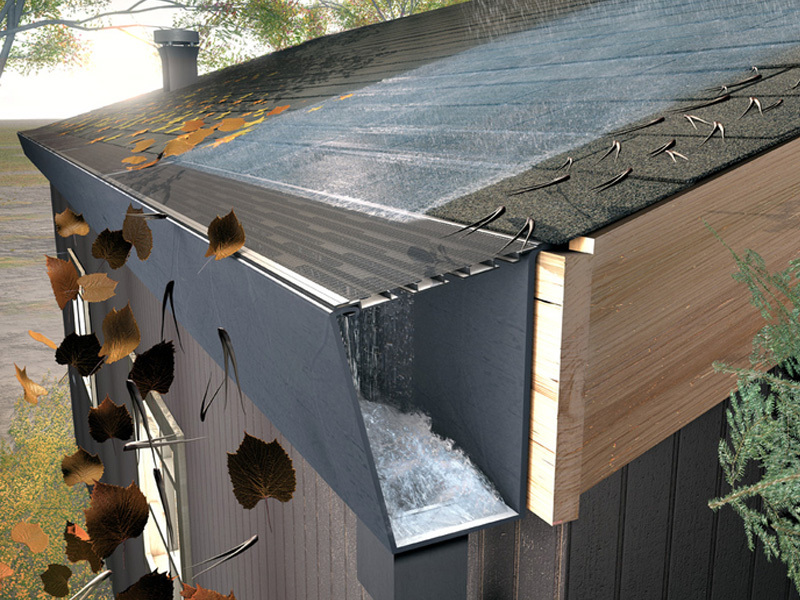 Leaking gutters are not only annoying, but are a serious safety issue, and can cause significant damage to a home. 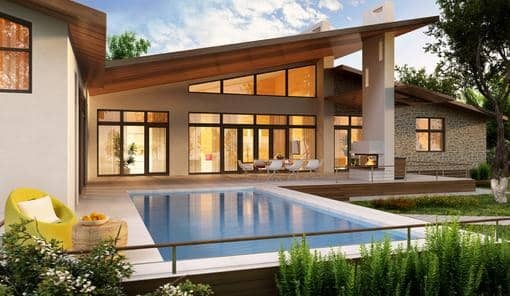 We can do a site evaluation to give you the best options for fixing the problems. 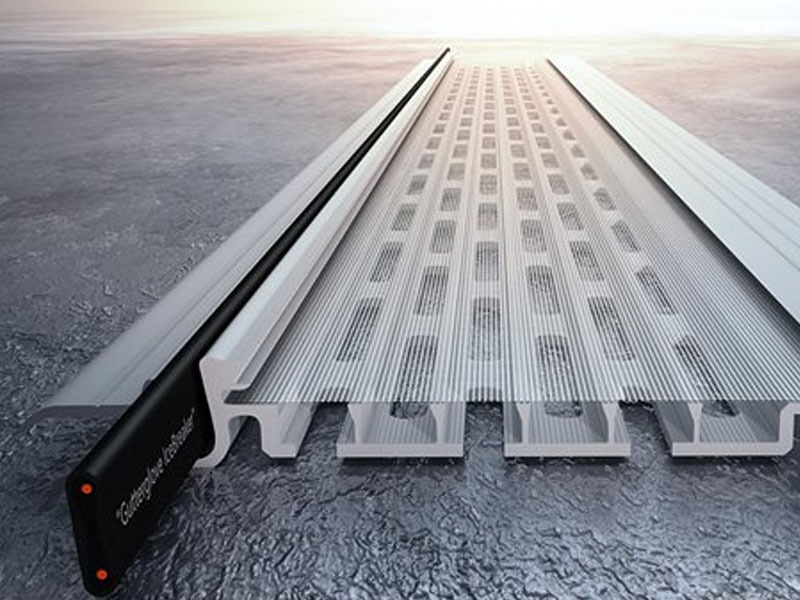 We can even guarantee your gutter system against snow and ice damage. 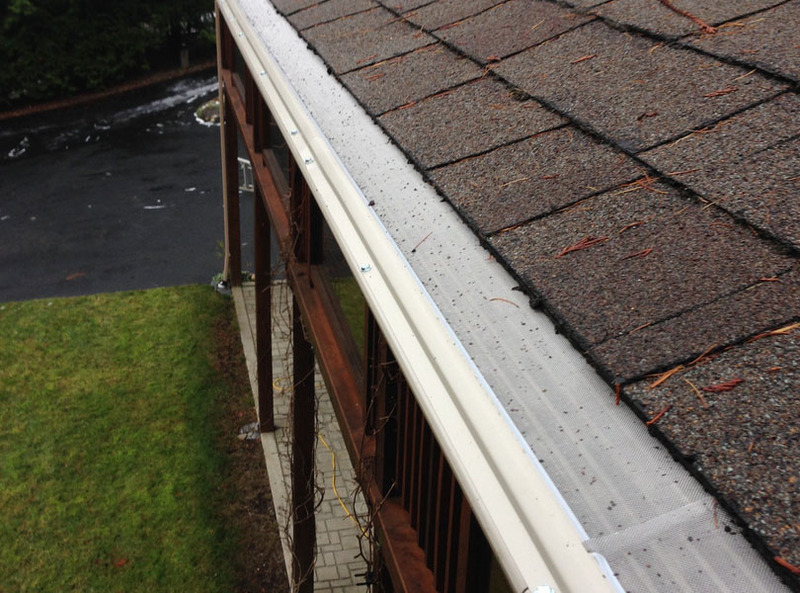 If the gutters are in good condition but just not performing well, we can adjust them to maximize their performance with minimal cost to you. 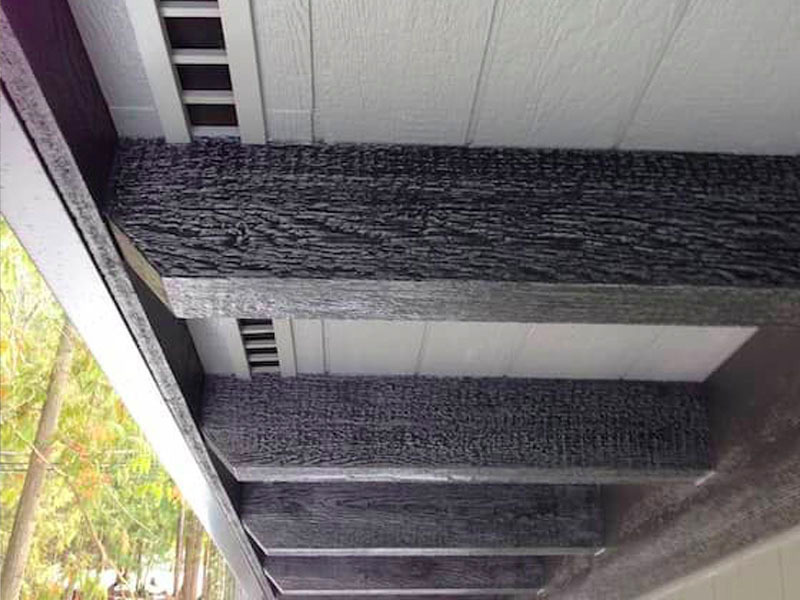 Standard gutter systems will occasionally need cleaning and maintenance, we offer seasonal maintenance programs that include cleaning, gutter evaluation and maintenance. 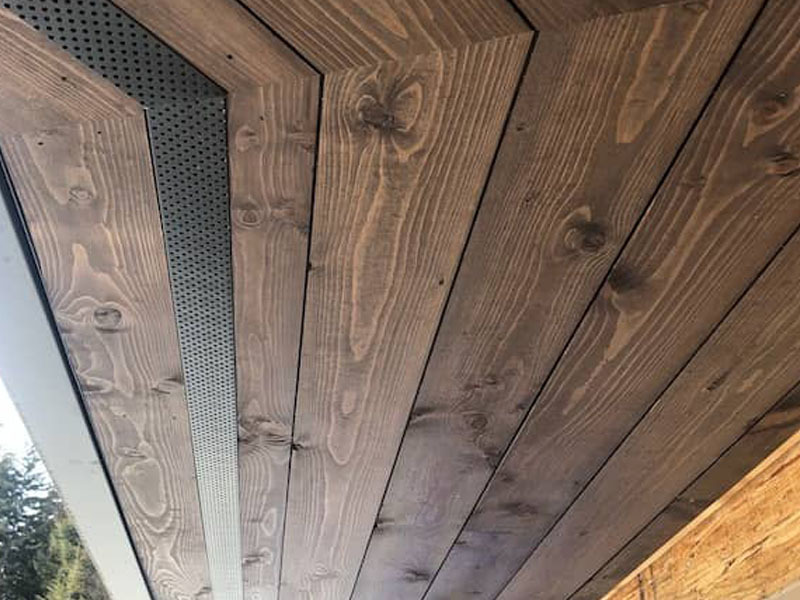 Our warranty is un-matched in the industry, our standard warranty is five years but a lifetime warranty is available in certain conditions. 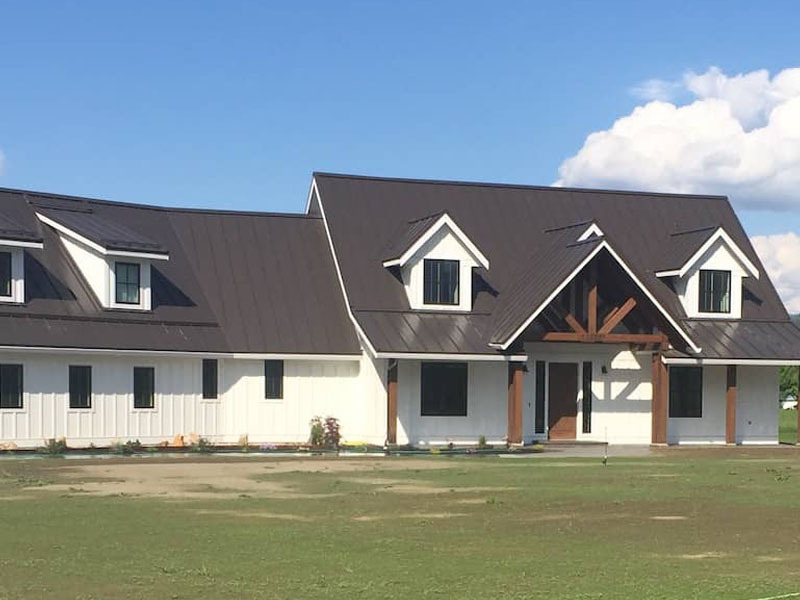 A warranty is worthless without someone standing behind it, and since we have been in business for over 25 years you can rest assured that maintaining our reputation by keeping our clients happy is our top priority. 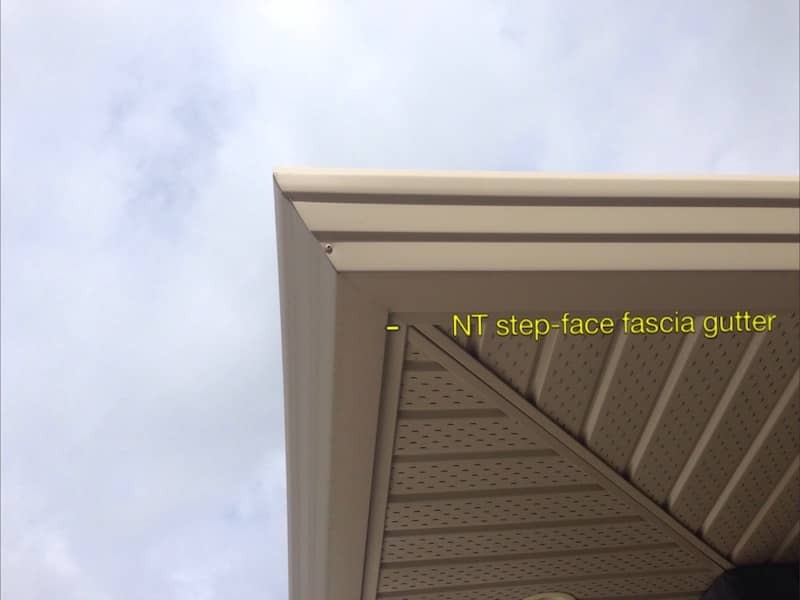 Streamline Exteriors is Canada’s number one distributer of the top rated leaf-guard by consumer reports. 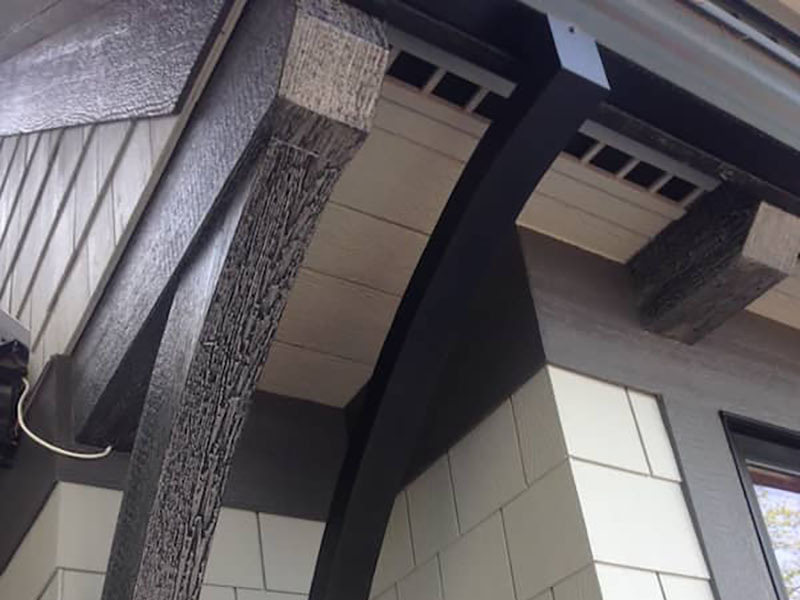 Gutterglove is a anodized aluminum frame with a stainless steel mesh which completely eliminates gutter cleaning, and is barely visible from the ground. 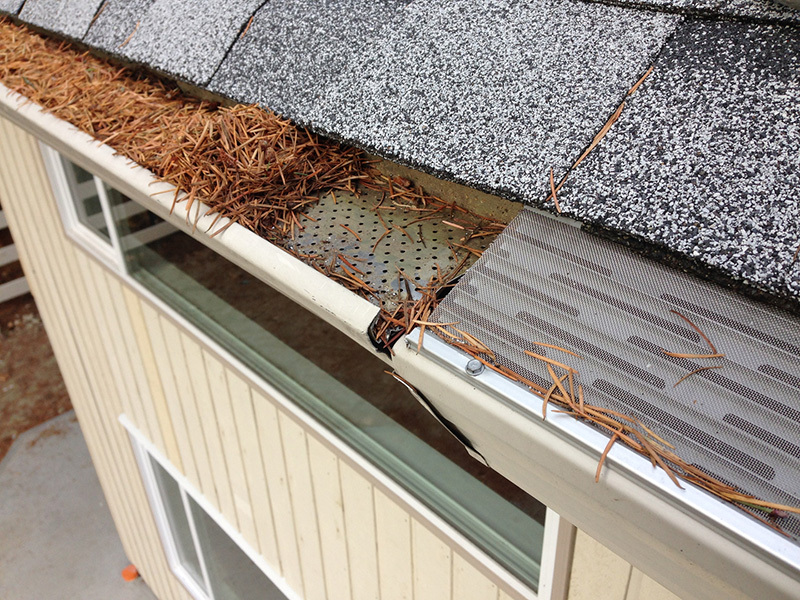 Gutter-glove pro also makes the gutters incredibly strong and helps prevent snow damage. 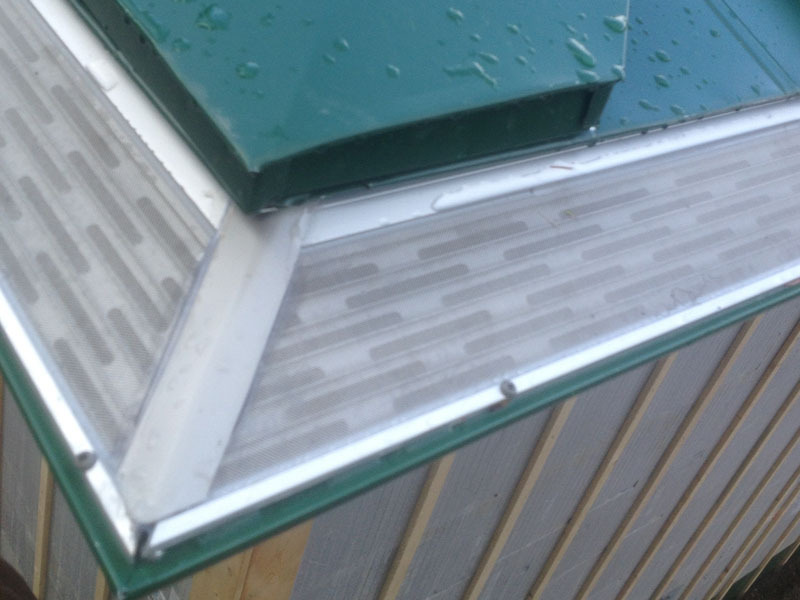 Many gutters have undersized outlets which can clog easily, by installing high capacity funnel outlets in maintenance is greatly reduced. 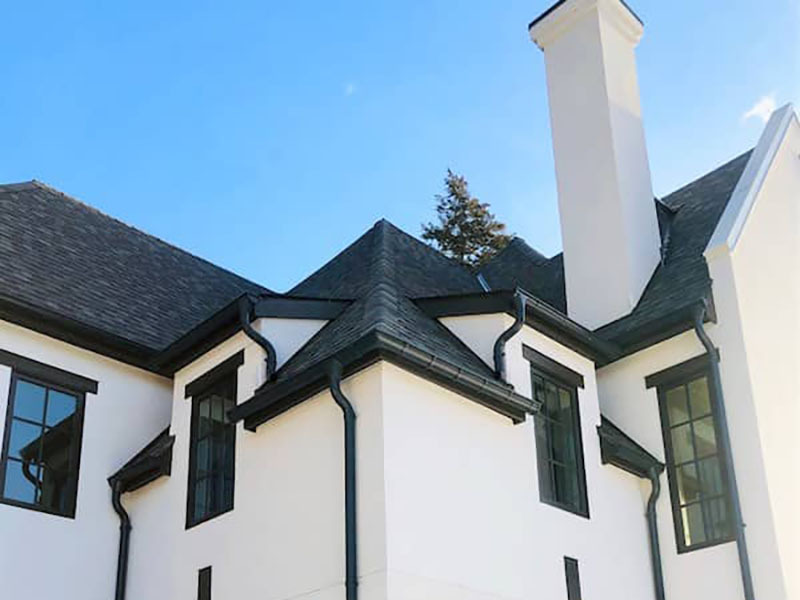 In situations where ice and snow put extreme stress on gutters, Gutterglove Ice-breaker can fix the problem permanently, and keep all debris out of your gutters. 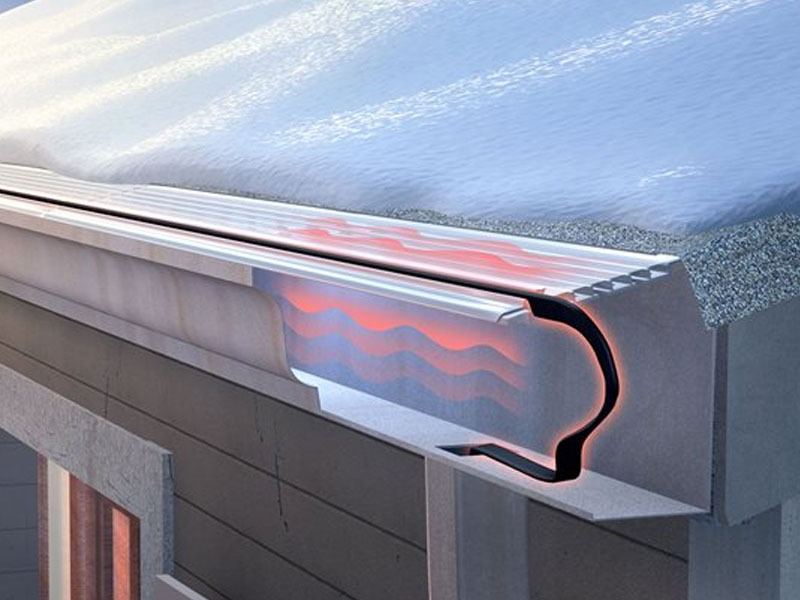 Ice-breaker works by creating a micro-climate inside the gutter using a Nu-heat cable system which eliminates ice damming keeps the gutters running all season. 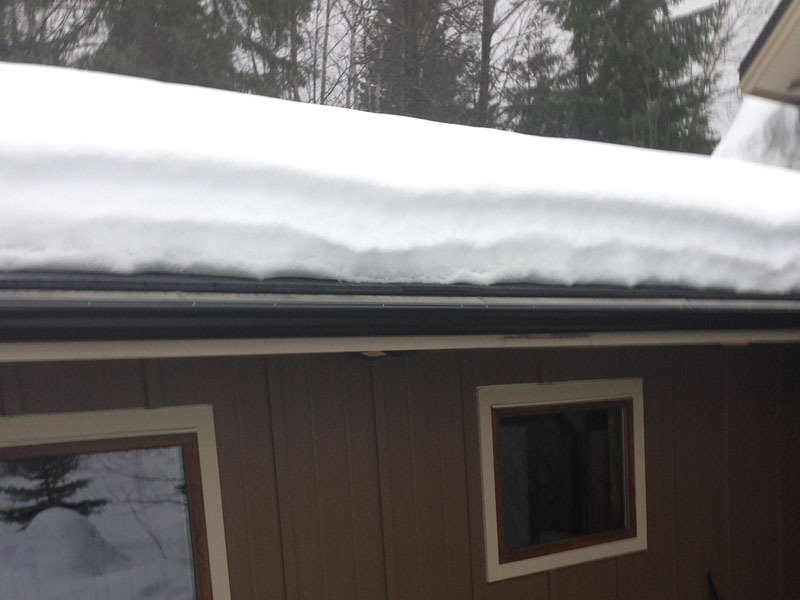 Snow stops, or snow brakes hold snow on roofs that are susceptible to sliding snow, and in so doing prevent damage to railings, gutters, lower roofs and even people. 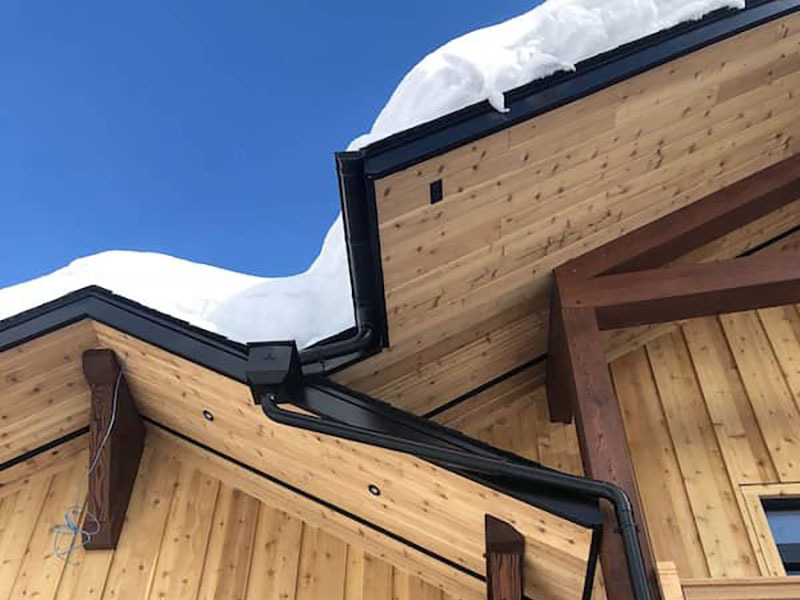 We offer colour matched snow bars, roof clamps (which don’t penetrate the roof membrane) slate roof snow stops and many other mechanically fastened snow guards. 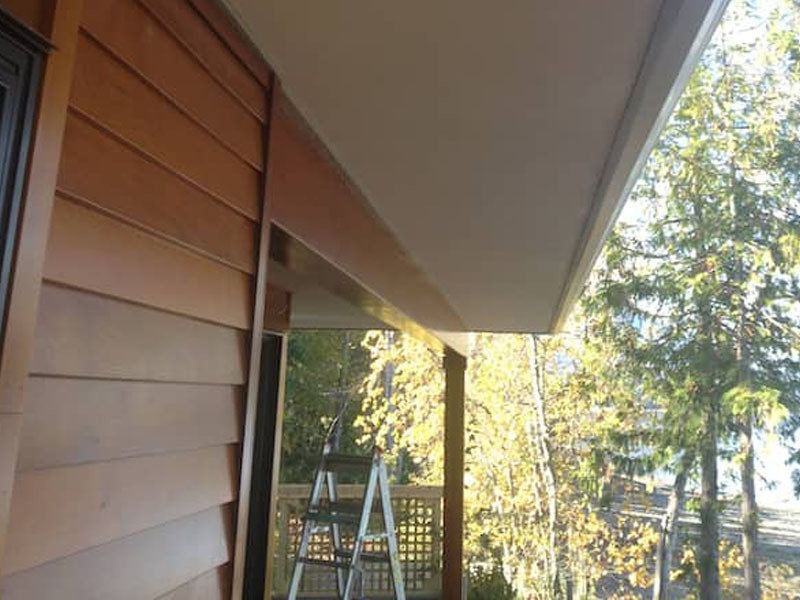 Wood peckers, Flickers and many other birds can wreak havoc on siding, gutters and your sanity. 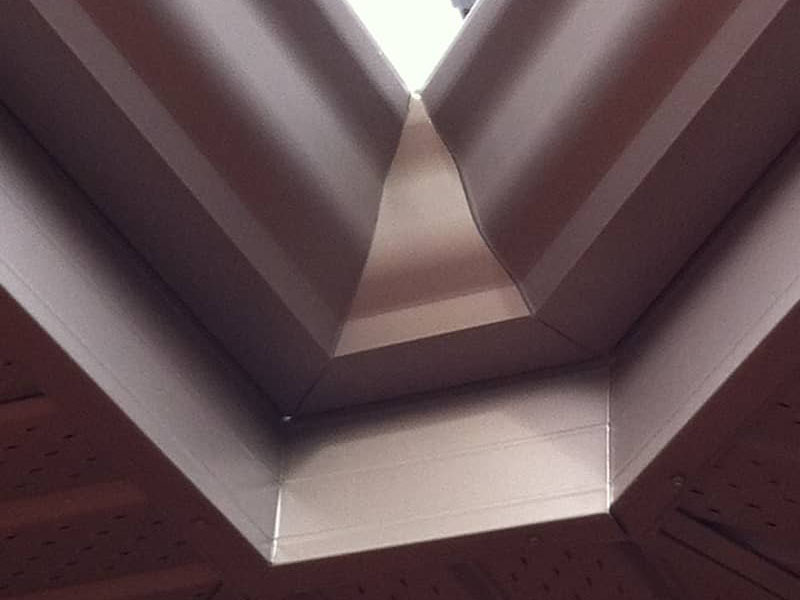 We can install many types of bird repellents that will effectively solve your bird problems. 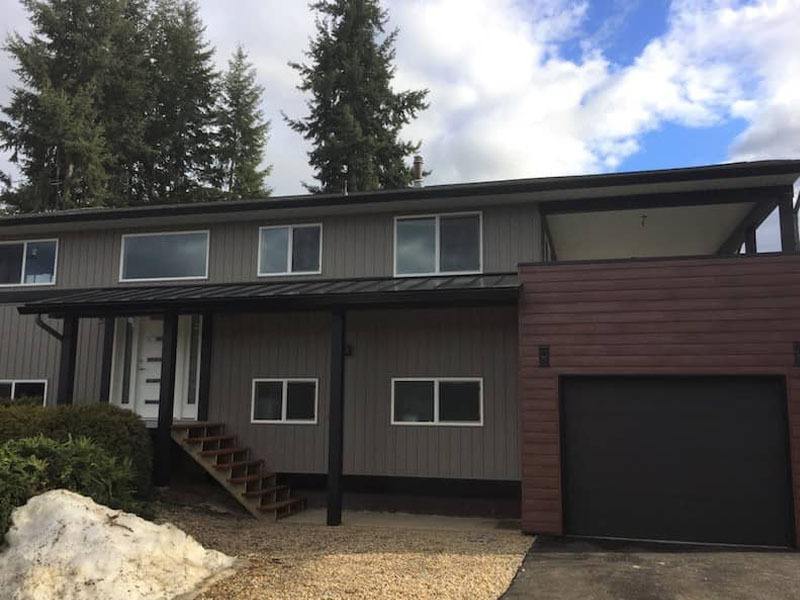 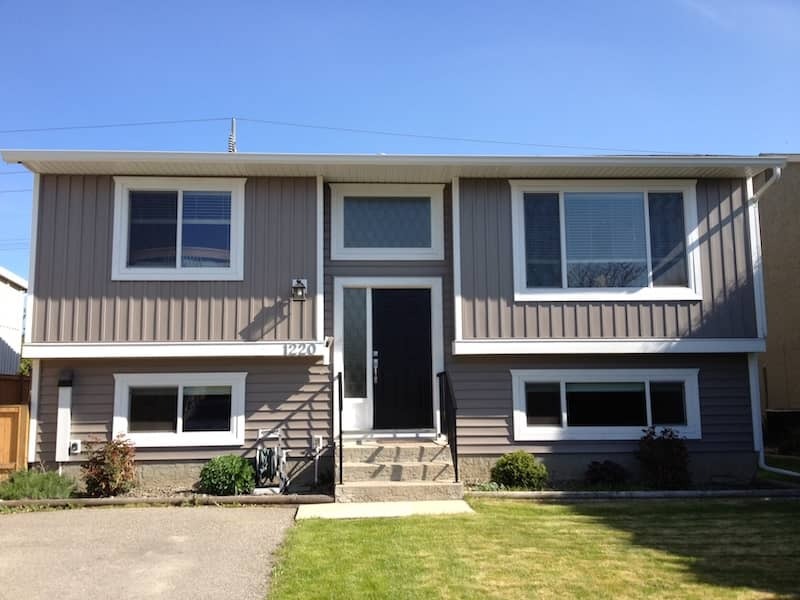 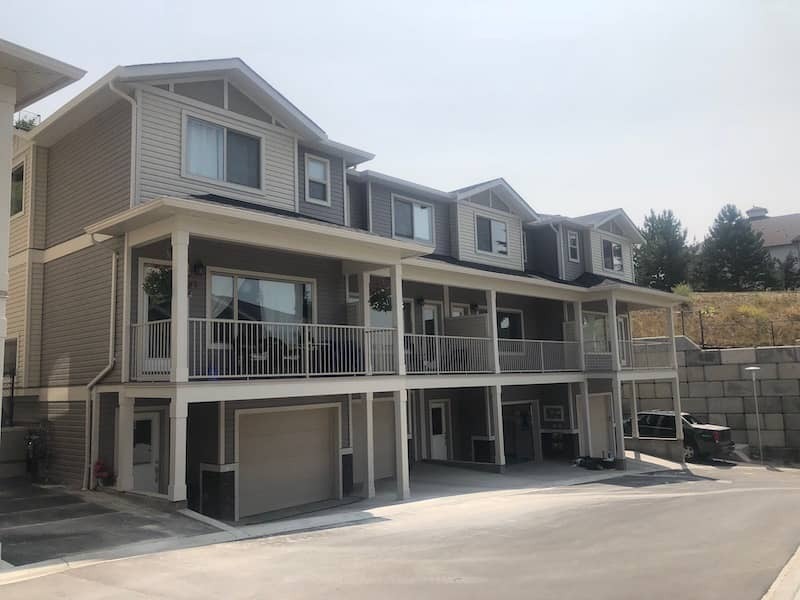 We have been installing vinyl siding in the Salmon Arm and Vernon areas since the company’s inception over 25 years ago and we are familiar with the challenges of a product which expands and contracts. 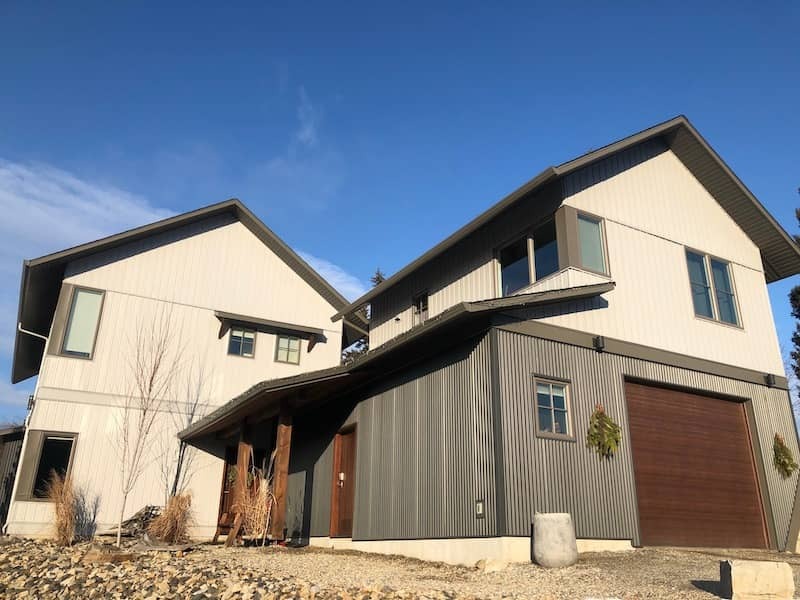 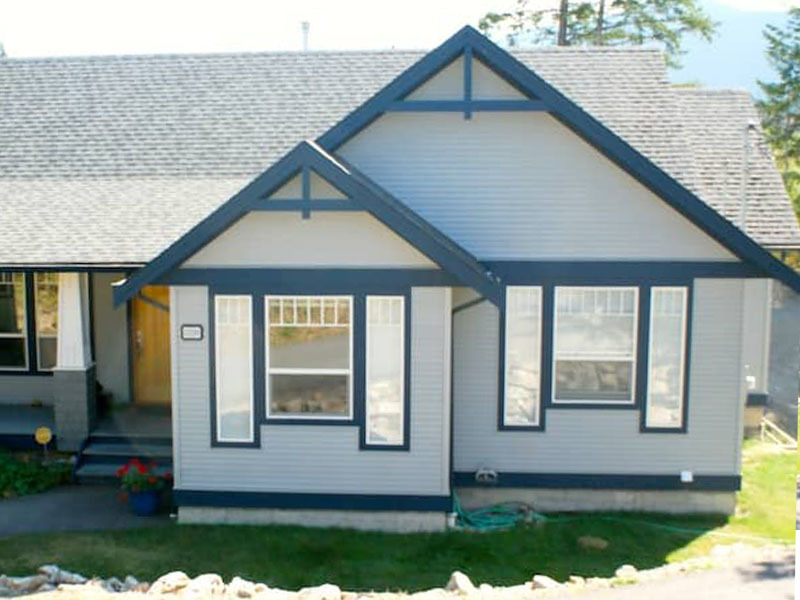 The integrated drainage plane of vinyl siding makes it a good choice in all areas of the Okanagan and its easy-care properties make it an easy choice for maintenance. 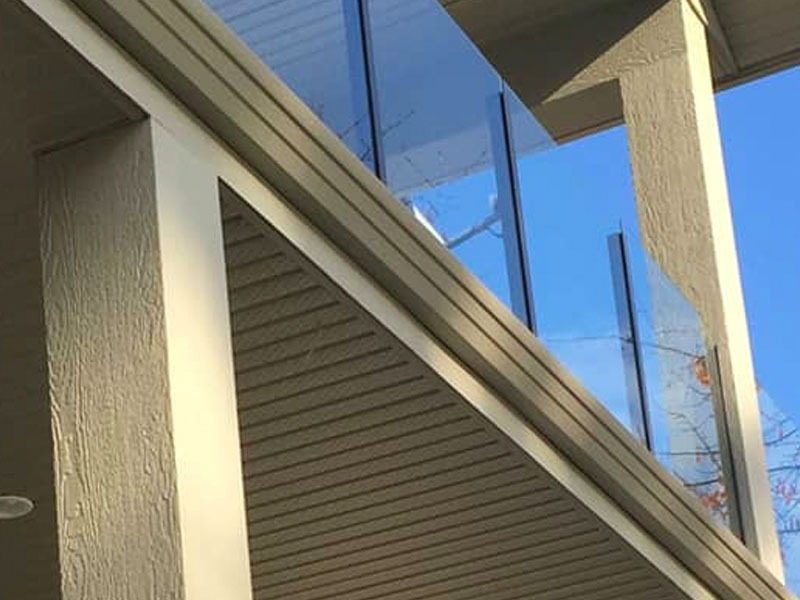 Fibre-cement sidings such as James Hardie and Allura are a popular durable option, and our installers are extremely experienced in all different facets. 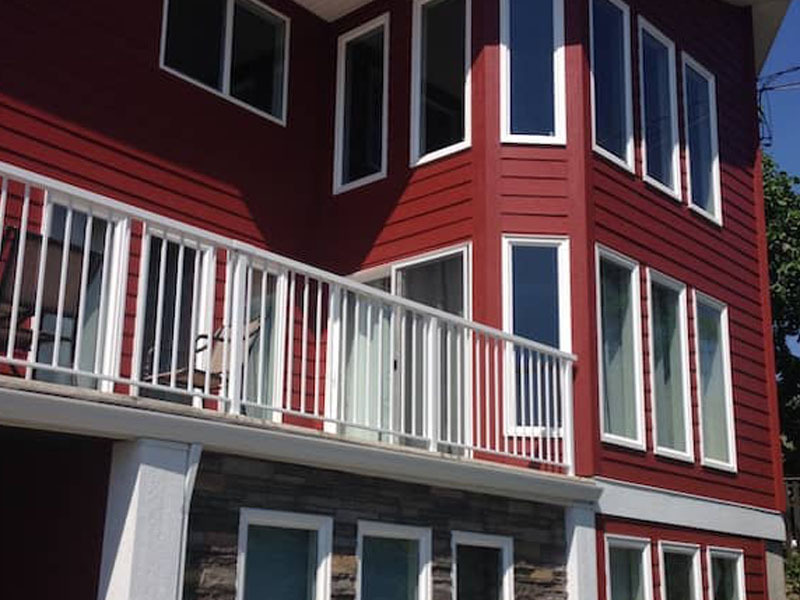 From the standard horizontal reveal siding to shakes, board and batten, smooth finish or easy trim reveals. 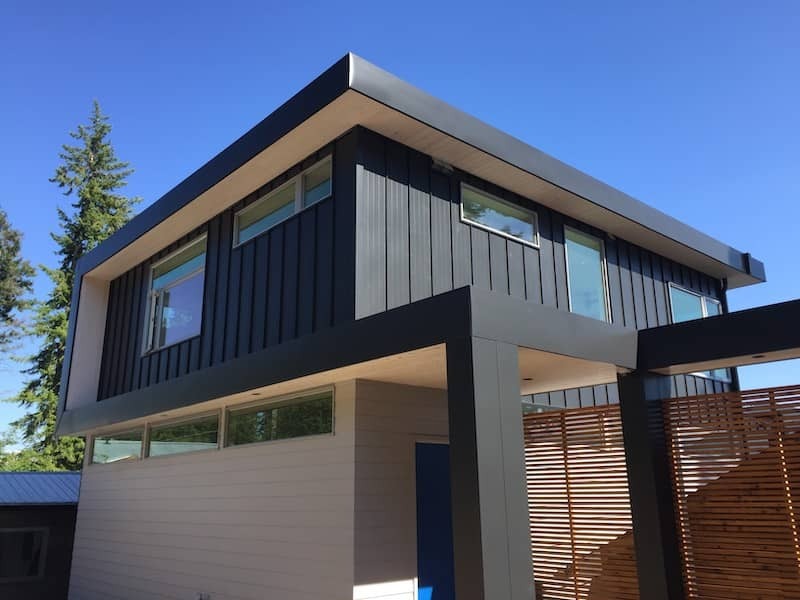 As with anything the beauty is in the details and such small details like the flashing, window trims, or the timber details combine to make the difference from a standard renovation to a truly stunning home. 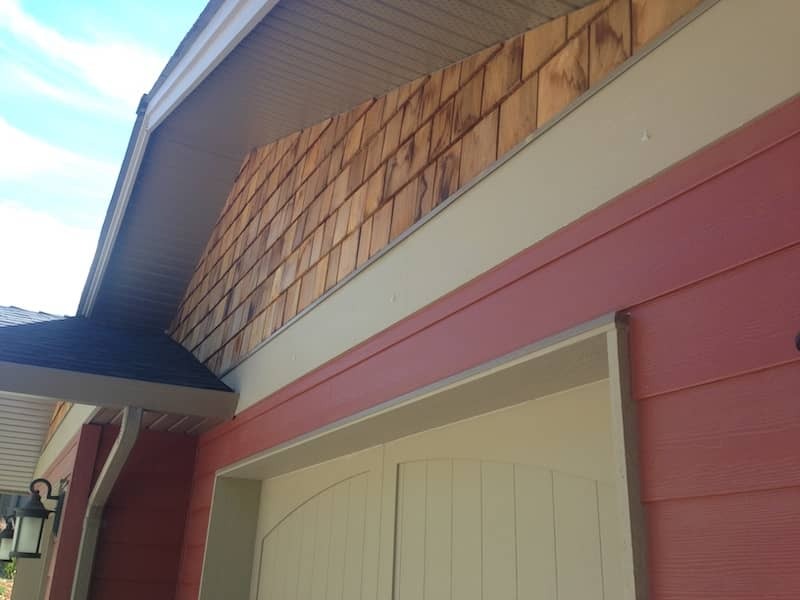 If conscientiously installed with proper ventilation and staining the classic beauty of cedar siding can last just as long as modern alternatives and will never be out of style. 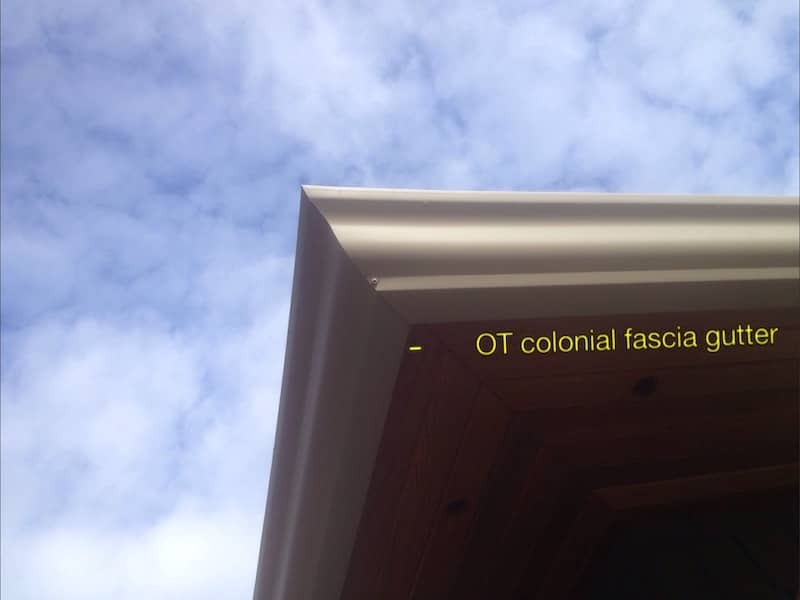 Soffits are the underside of your eaves and must allow for ventilation and protection against bugs, animals, and mould. 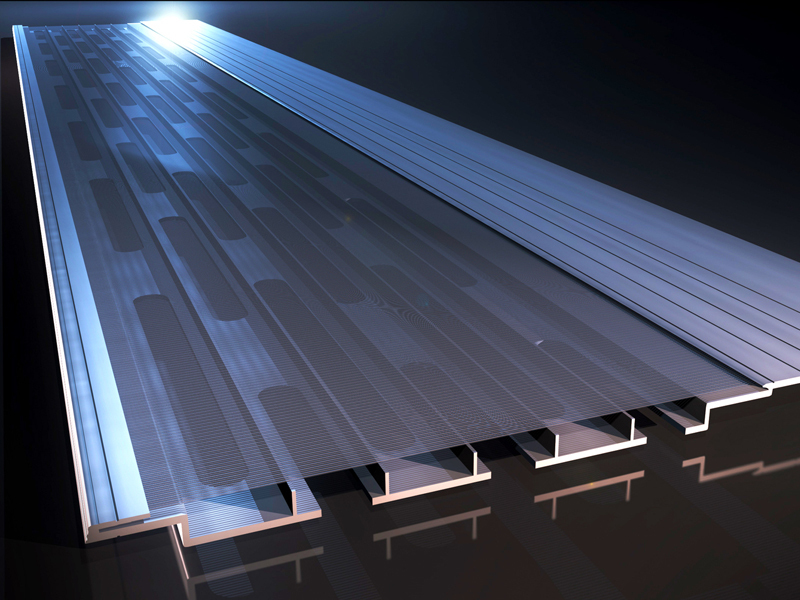 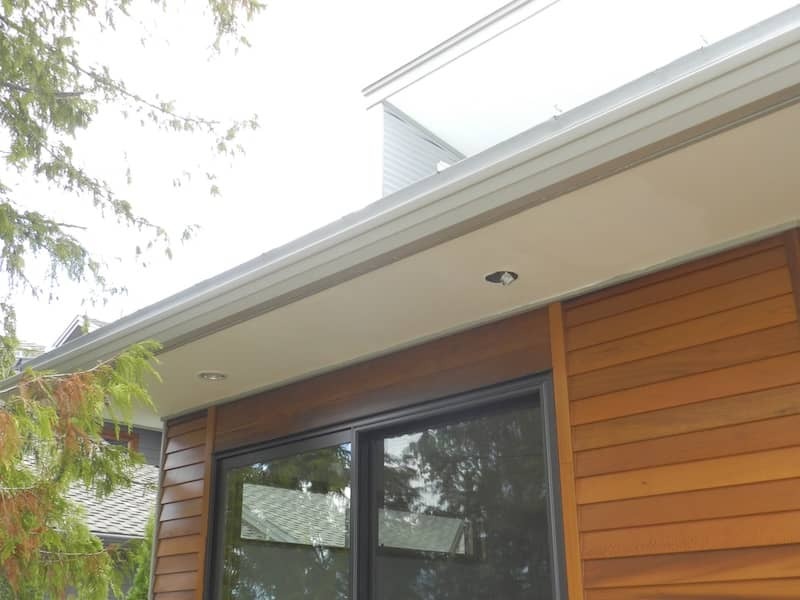 Soffits are available in aluminum, longboard extruded aluminum, cedar, fir, fibre cement and composite. 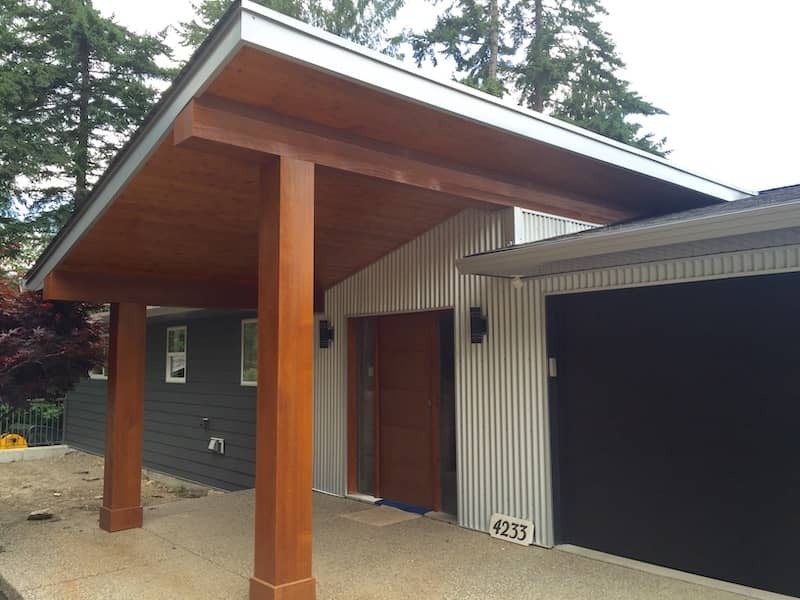 Our installation teams are familiar with metal siding options such as: Longboard, Lux, corrugated steel, and custom fabricated steel. 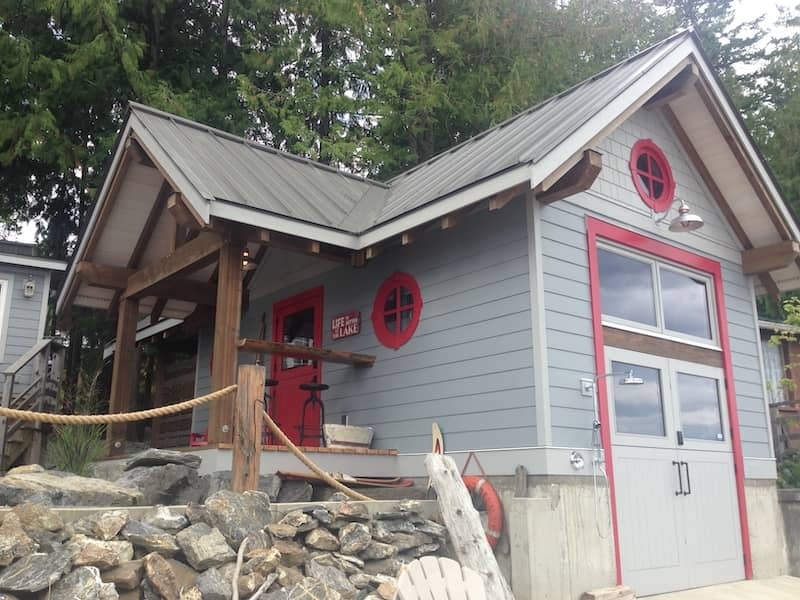 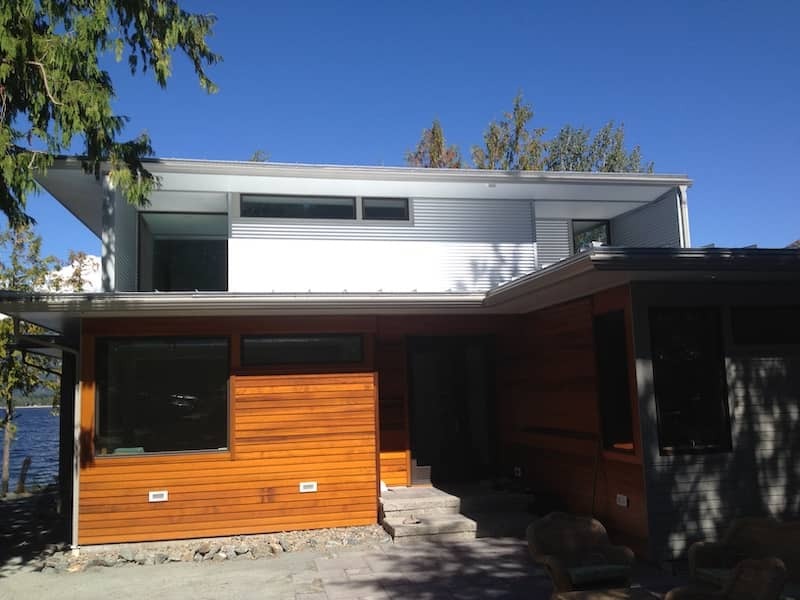 Metal siding results in a maintenance free modern looking home that’s resistant to fire,rot or pest damage. 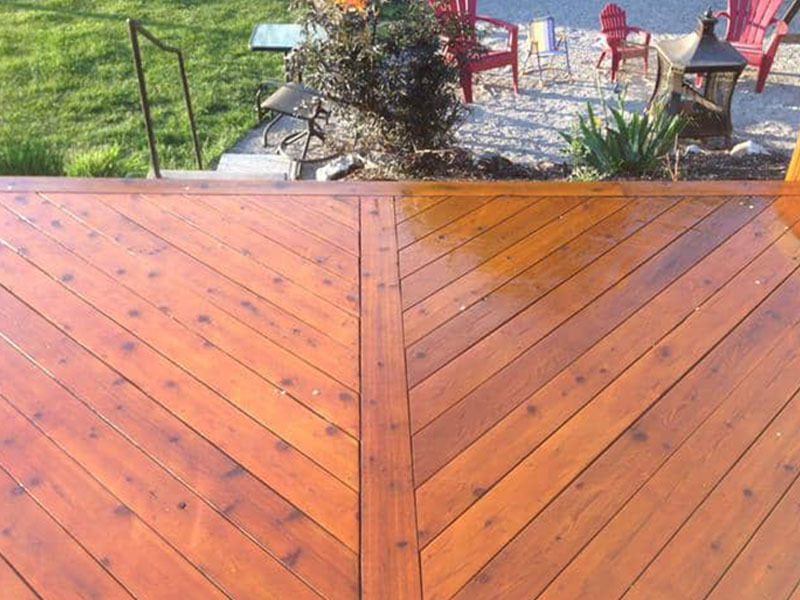 In the Okanagan Shuswap our decks are the best way to take advantage of our beautiful weather. 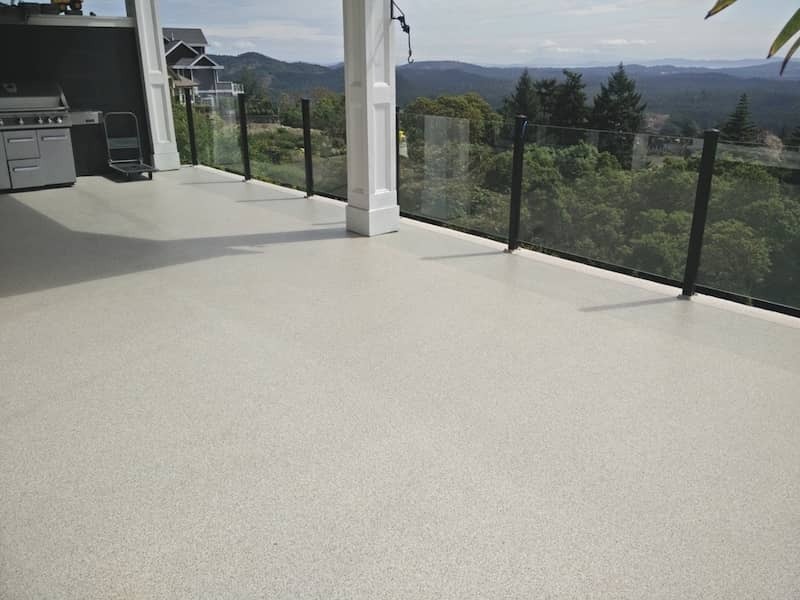 Whether you want the easy maintenance and water proofing of Flexstone liquid deck membrane, vinyl, cedar or composite we can take care of all your needs. 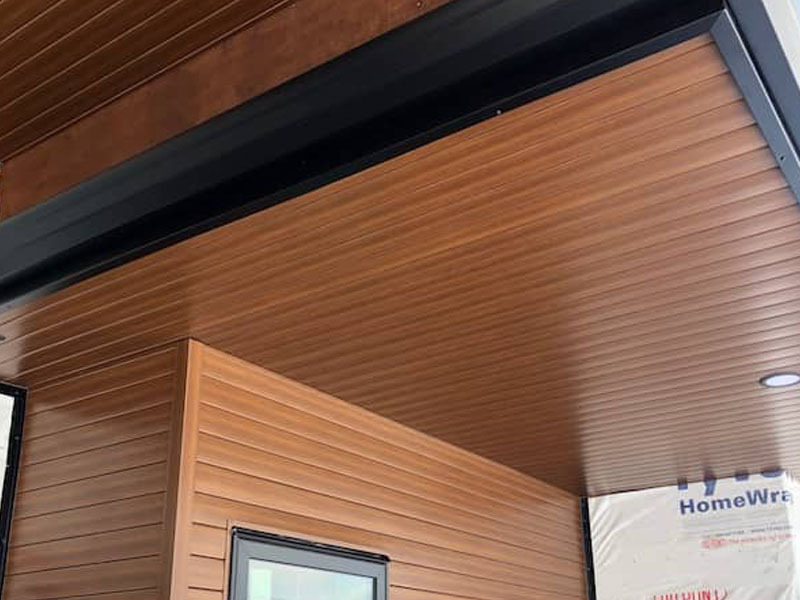 Small details such as fastener choice, stain quality and surface preparation will make the difference now and into the future, because we all want to enjoy our decks, not maintain them. 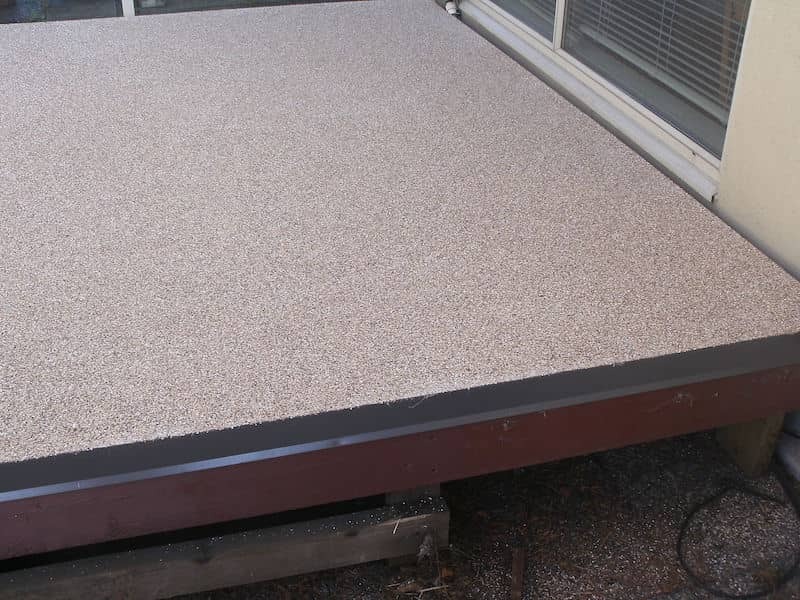 Flexstone membrane is the most durable CCMC approved deck membrane on the market today. 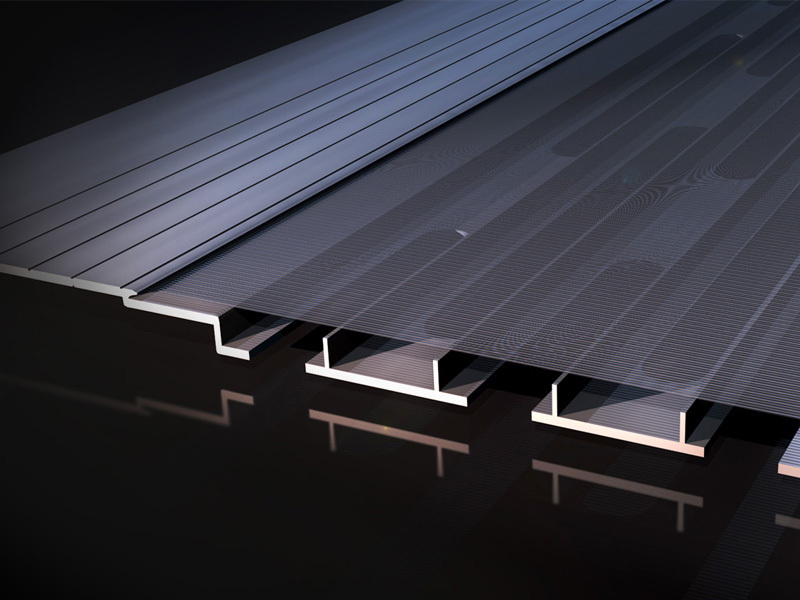 It was originally developed for Ski resorts that could withstand the harsh weather and extreme temperature swings. 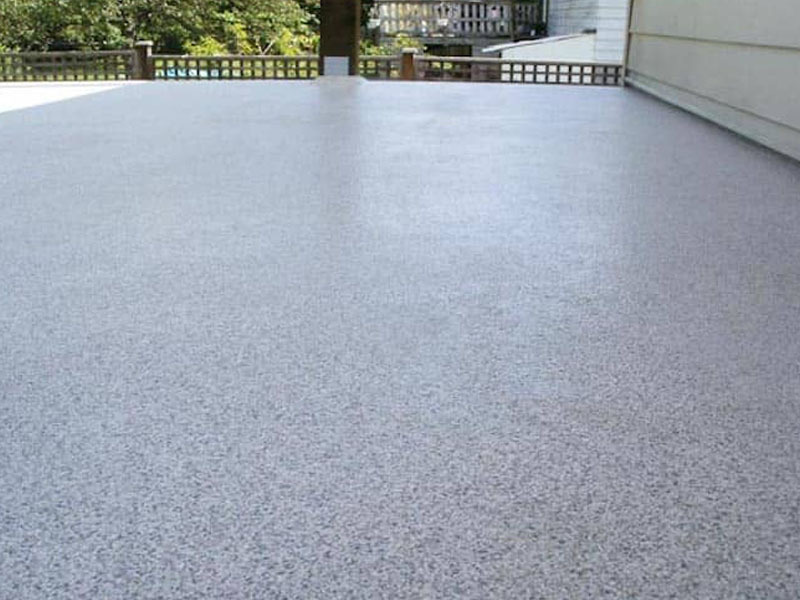 Flexstone is a liquid applied stone finish seamless membrane available in multiple stock colours and custom colours. 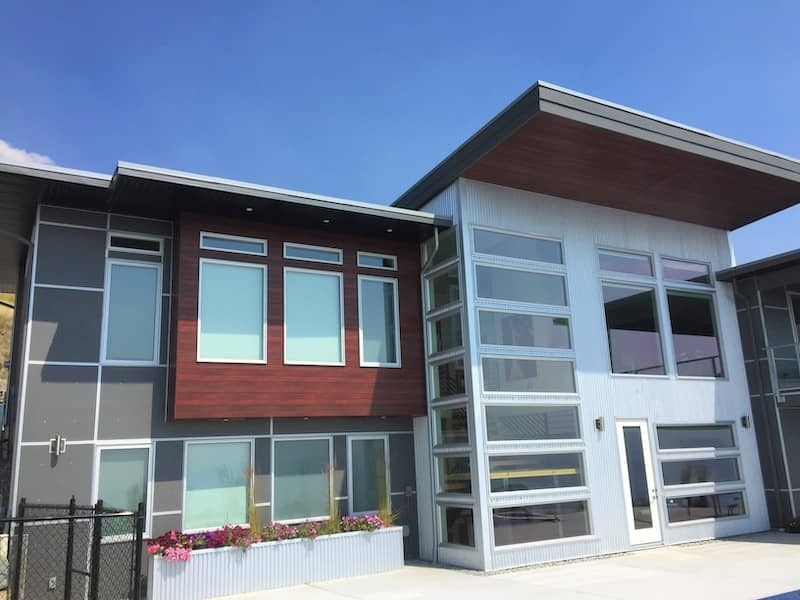 Window and door openings are the most common cause of building envelope failure and can cause catastrophic problems. 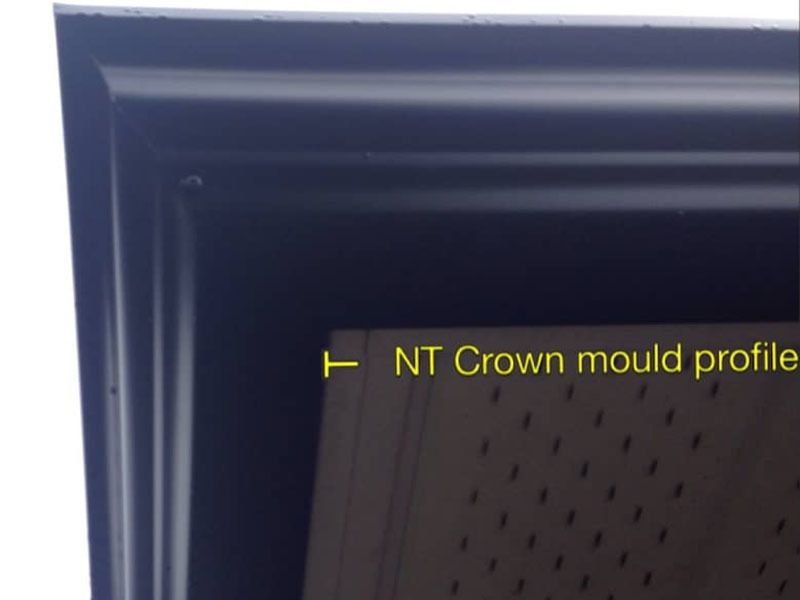 Since many of these problems are not evident for years after installation, it is imperative to get qualified installers who understand proper installation techniques. 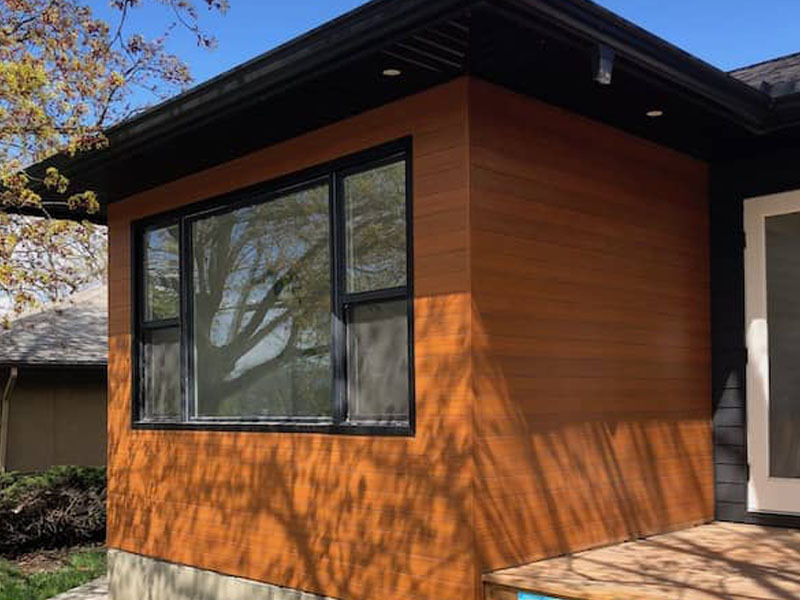 Streamline is recognized as one of only 200 premium renovators in Canada by Gentek building products and is certified for the LePage quad max seal installation method.